Before I became a stay-at-home-mom I worked in Dallas for a pharmaceutical distributor. My boss used to talk about this cake she would make for her kids for their birthday. At this point her kids were already grown adults, but they still would request this cake for their birthday. She always said it was super simple to make and I remember it required poking holes in a cake and pouring Jello over it. 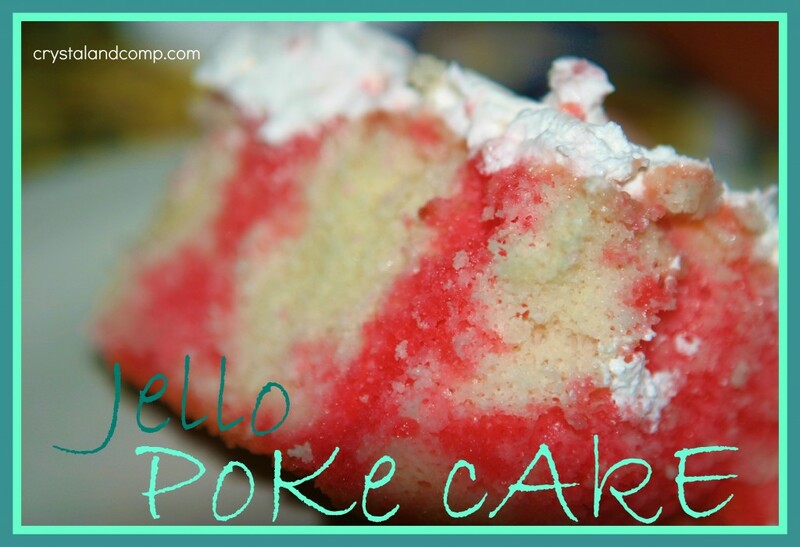 It’s called a Jello Poke Cake. 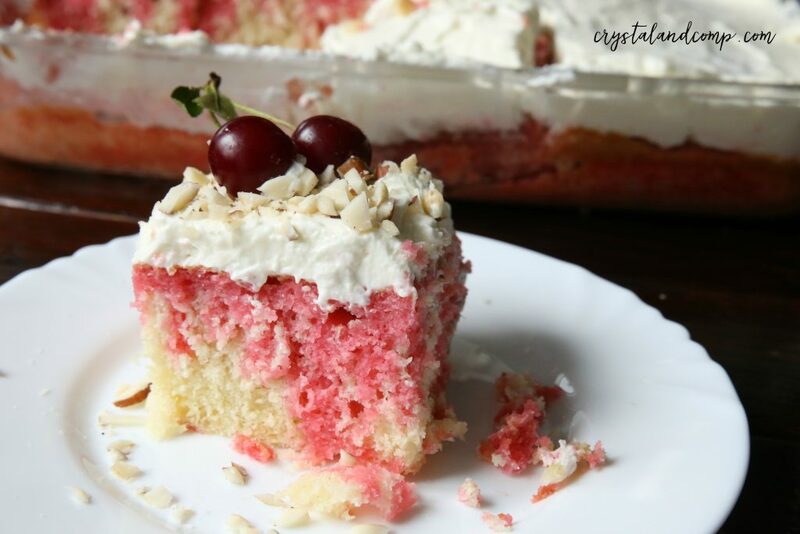 It sounds simple, fun and yummy and I have wanted to make one for a long time but did not have an official recipe other than what I knew from conversations. Yesterday Luke and I made this cake together. He wants to be a chef when he grows up, ya know. Bake the boxed cake mix according to the direction on the back of the box. I baked it in a 9×13 cake pan. When it is done, let it cool. Once it is cool, poke holes in the cake using a toothpick. Left to right, top to bottom, lots of holes. 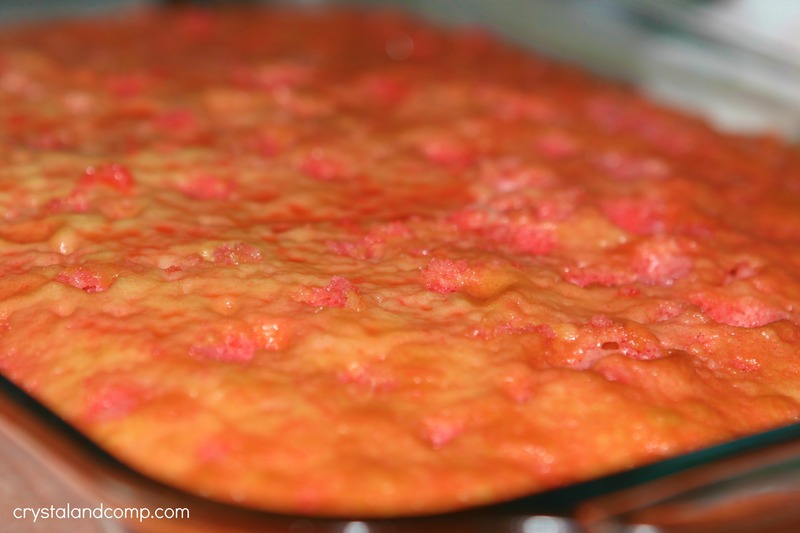 Mix your 3 oz box of Jello, we used strawberry, with 1 cup boiling hot water and 1/2 cup cold water. I accidentally used too much water, but it turned out just fine (and sweet). Pour the Jello liquid evenly over the cake. Cover it and pop in the fridge for 2-3 hours to let it chill. When you’re ready to frost it, cover the top of the cake in thawed whipped topping. How easy and beautiful is that? I really like how it looks in a glass dish. When you cut the cake into slices it will have the color of the Jello running through it. Beautiful! My kids thought this was just too cool and super yummy. I thought it was light and perfect for summertime and the holidays. 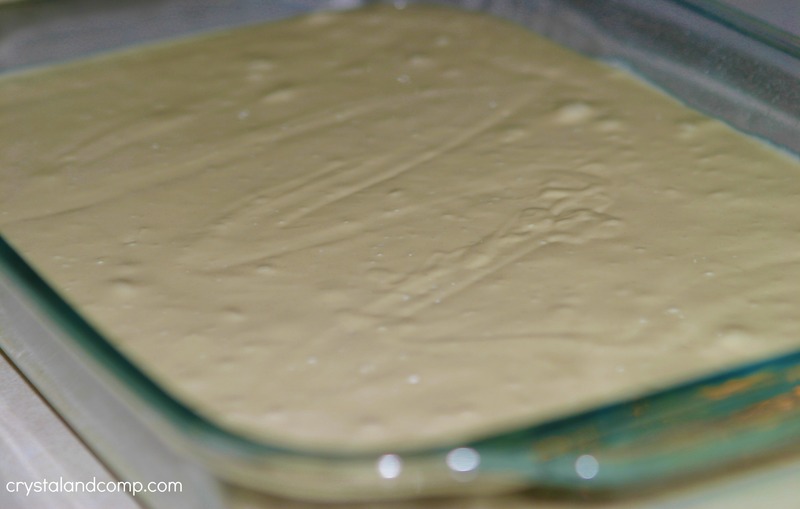 This jello poke cake will make any holiday! Bake the boxed cake mix according to the direction on the back of the box.Then allow it to cool. poke holes in the cake using a toothpick.Left to right, top to bottom, lots of holes. 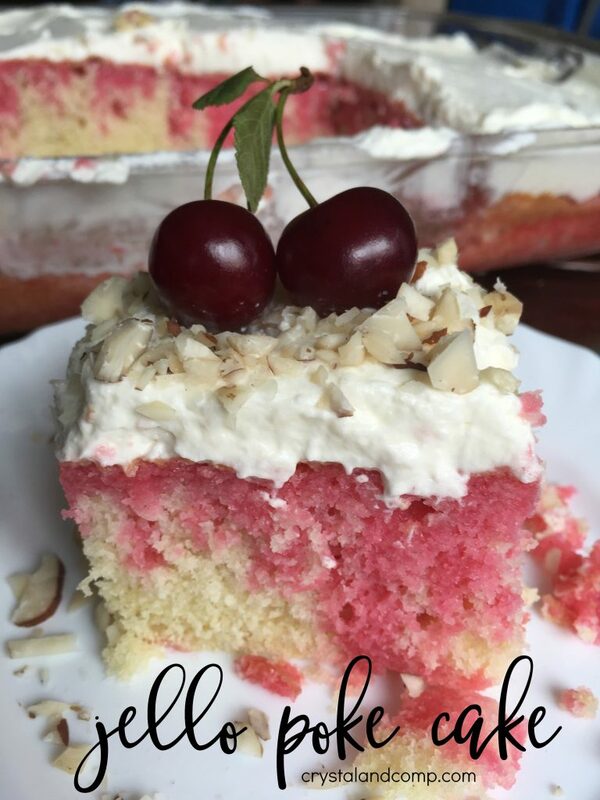 Mix your 3 oz box of Jello, we used strawberry, with 1 cup boiling hot water and ½ cup cold water.Pour the Jello liquid evenly over the cake.Cover it and pop in the fridge for 2-3 hours to let it chill.When you’re ready to frost it, cover the top of the cake in thawed whipped topping. It is yummy Crystal! My mother in law makes it. The only difference is she adds frozen strawberries to the jello mix. Yummmmm! Kim, I found a recipe online that called for a layer of crushed strawberries. It looked amazing, but I wanted to keep it as easy as possible. Plus I was not sure how the kids would react to the crushed fruit. Thanks Katherine, my kids loved it. Crystal recently posted..Are All Lady Bugs Ladies? 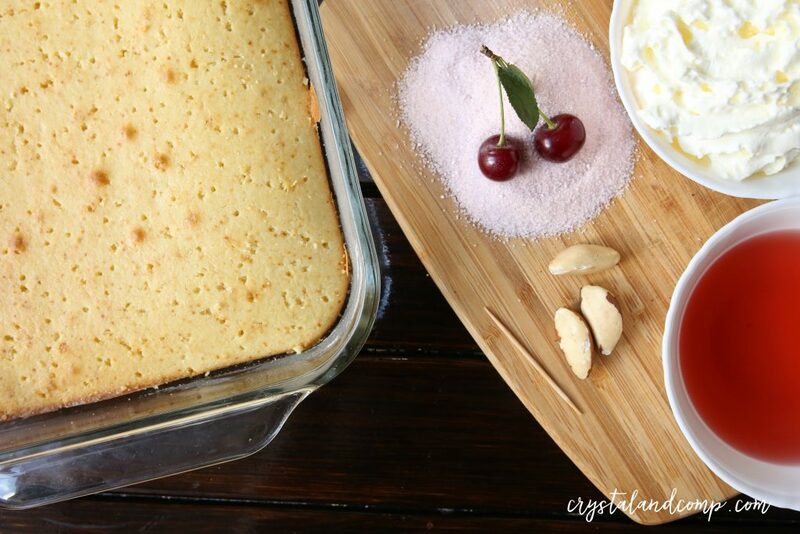 For a recipe that combines two childhood favorites, cake and jell-O, it is no wonder that the kids of the pharmaceutical distributors would ask for it even if they were adults themselves now. It will surely be a hit with a lot of kids and kids at heart. Looks yummy! I made a cake similar to this years ago, but it had crushed pineapple too. It was a big hit. This looks fabulous, and I love the look of it too! So pretty! We have a family member’s birthday to celebrate on Monday–perhaps I’ll make a poke cake for him? I think you’re right about it being pretty in the glass dish, too. Glad you linked to Food on Fridays–it’s always fun to get new ideas! 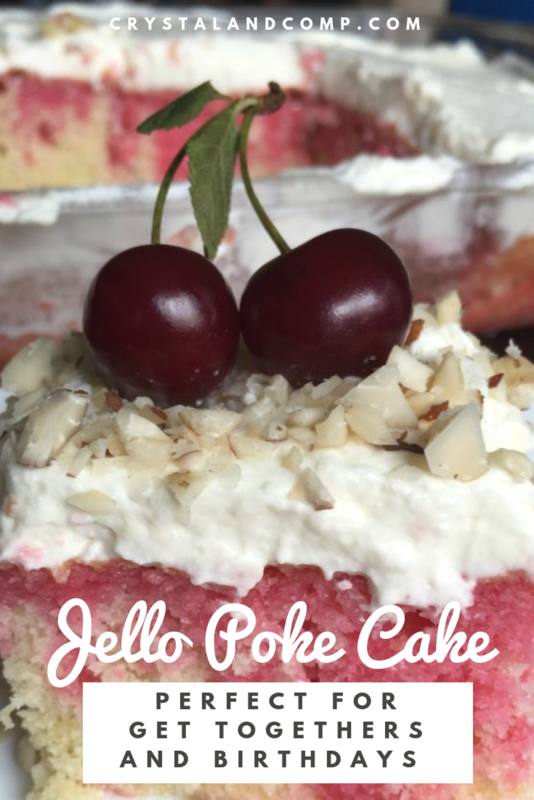 I just love a Jello Poke Cake, it is a great summertime dessert. Hope you are having a fantastic week and thank you so much for sharing with Full Plate Thursday. I have made this for years, with all flavors of jello. The one difference is that I add jello to the whipped topping. A lot of times using 2 different jellos, especially at Christmas. 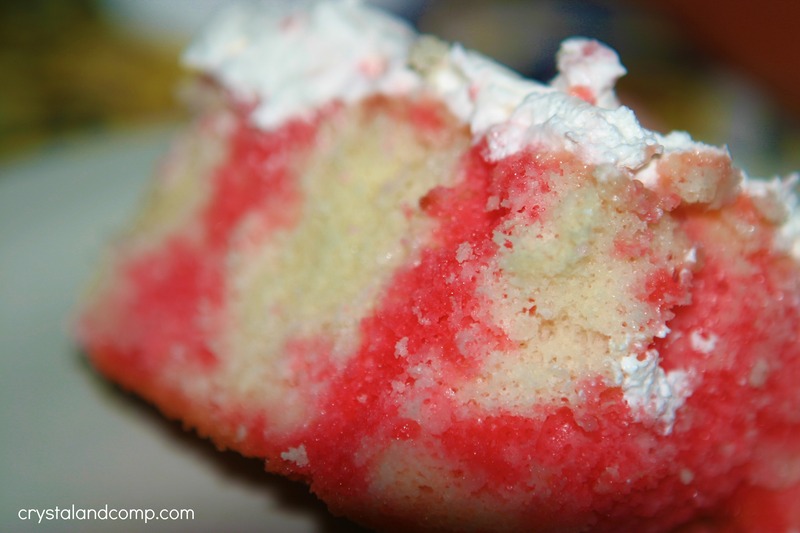 Jello poke cakes are a classic. 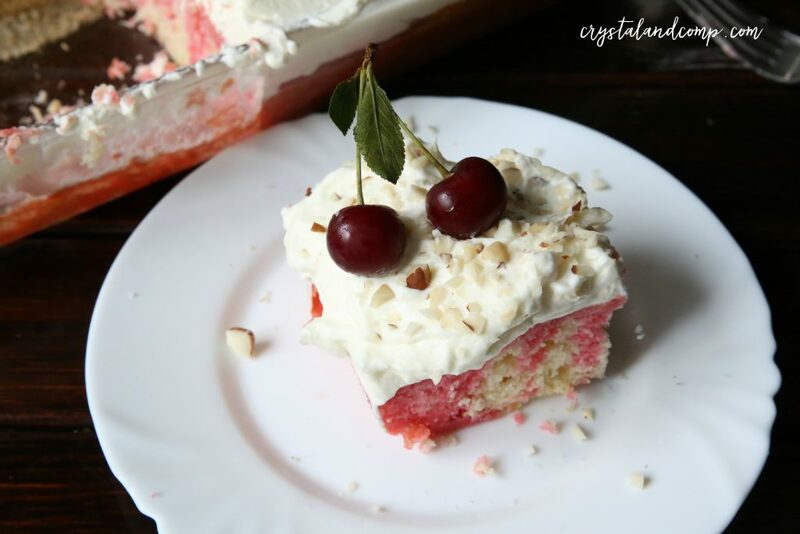 Cherry Jello happens to be my personal favorite :). My 9 year old is on a baking kick. This looks like a fantastic recipe for her to try! I made this for my Mothers Day Barbaque and it was wonderful so cool and refreshing and my kids my grands and great grands loved it. Thanks for posting.